I loooove teaching, 'cos I get such a kick out of seeing what people make after just a few hours of learning new techniques. A couple of days ago I had a visit from Jenny and Steph, who did a term's-worth of silversmithing classes with me and turned up at the studio wearing all of the fabulous bling that they had made. Hello instant family heirlooms! I'm teaching a four-hour beginners' silversmithing class on 10th October from 10am-2pm at Kiln Gallery in Paddington, Brisbane. 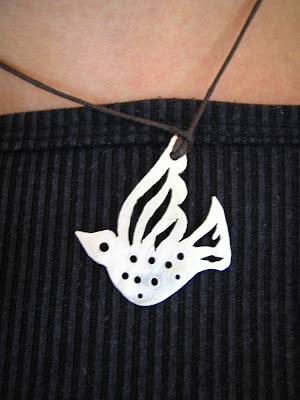 You'll design and make a pendant or ring in sterling silver and you'll be wearing it by the time you walk out the door. Cost is $50 which covers all tools and materials. Please phone Kiln Gallery to book your place on 3876 6903, or email info@kiln.com.au. We're gonna have fun! Come and play! I don't this year, but we're building a purpose-built studio at our house at the moment... (I may have mentioned that in the blog once or twice or a hundred times)... so I'm looking at running classes there next year. Drop me your details on email via my website if you're interested, and I'll get in touch!